Nemawashi (根回し) in Japanese means an informal process of quietly laying the foundation for some proposed change or project, by talking to the people concerned, gathering support and feedback, and so forth. It is considered an important element in any major change, before any formal steps are taken, and successful nemawashi enables changes to be carried out with the consent of all sides. Nemawashi literally translates as “going around the roots”, from 根 (ne, root) and 回す (mawasu, to go around [something]). Its original meaning was literal: digging around the roots of a tree, to prepare it for a transplant. This is a concept to ponder. It involves the major aspects of planning, where chief among those aspects is not only communication but empowering the ultimate end-user with a sense of inclusion in the process. Many a plan hatched in management never see full implementation because the deckplates (naval term for rank and file) are never involved in the process. A process conceived in a vacuum, usually ends up with the same results, empty. 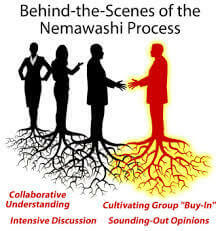 So next time you are thinking of implementing a new policy, program or any aspect of the business which will effect one or more people (including customers and vendors) think about Nemawashi and consider utilizing its principles before you “spring” the news. Next Post: Do Your Employees Have Any Idea ‘How The Money Works’ In Your Business?